After a few days of perusing the halls of Baselworld 2016, a few early favorites have become evident. I’m enjoying Seiko’s ongoing globalization, which places so much of what Seiko’s local Japanese market has long enjoyed into stores worldwide. With Grand Seiko now firmly embedded within the United States at a selection of retail stores and at the brand’s own New York City boutique, Seiko plans to add many more of its previously domestic-market mechanical timepieces in those same global locations worldwide. The resulting new (for the globe) collection is Presage,featuring a wide range of calibers, and designs, aimed at enthralling a wider audience than it draws to its pricier and dressier Grand Seiko collection. Presage comprises sixty models and uses the full range of Seiko’s mechanical calibers, from the accessible 4R, through 6R to the exclusive 8R. Highlights include the 6R27 multi-hand power reserve model and a series using a new version of the 4R57 caliber. This new caliber is Seiko’s first with a center power reserve indicator, and is available in a series of five designs, including a limited edition. Every Presage watch has 100 meters of water resistance. My early favorite from Presage echoes the earliest chapter of Seiko’s heritage in mechanical watchmaking, which stretches back to 1913 with the Laurel, Seiko’s and Japan’s first wristwatch. 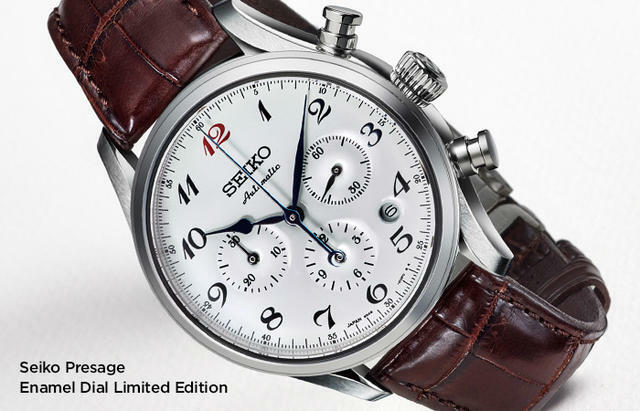 Seiko is offering two Limited Edition automatic chronographs with designs that echo the 1913 Laurel. These watches feature two types are artisanal dials: one in white enamel and the other with black Urushi lacquer. The lacquer dials are made individually in the studio of master craftsman Isshu Tamura in western Japan using the centuries-old art of Urushi, a technique that creates a particularly deep black color that also strengthens with age. Each dial is painted and polished by hand several times over a period of three weeks. 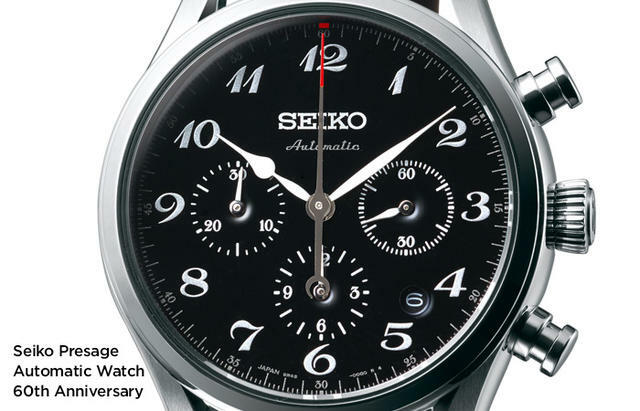 Both models use the 8R48 caliber, which has vertical clutch and column wheel systems, and both are offered in editions of 1,000 in celebration of Seiko’s sixty years of automatic watch making. Look for them in September. 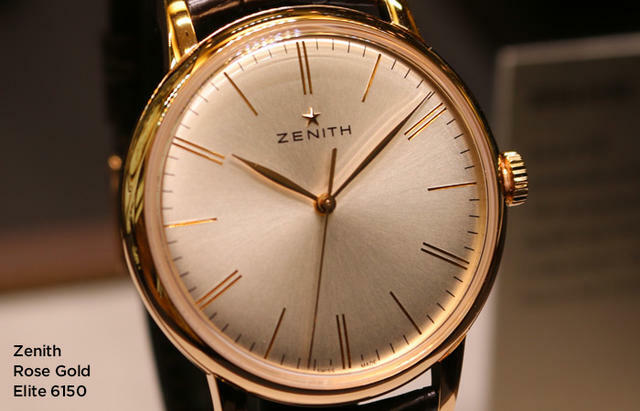 TheZenith Elite 6150,already a stand-out dress series from last year, this year adds a rich rose gold case that enhance its three-hand elegance. The watch’s smoothly polished 42 mm-diameter case, engraved hour-markers and thin leaf-type hands whisper class and softens the character of this basic dress piece. 3) A silicon escapement. The Swiss lever escapement was maintained, but with a wheel and lever made of silicon serving to reduce weight and thus inertia, as well as eliminating the need for pallet jewels. 4) A variable-inertia balance adjustable via four tiny gold weights situated around the rim. 5) Elastic toothing. As Breitling explains, the chronograph wheel and pinion, which can jerk when used, are here equipped with elastic toothing molding the shape of the opposite teeth, by means of a nickel-phosphorous structure. 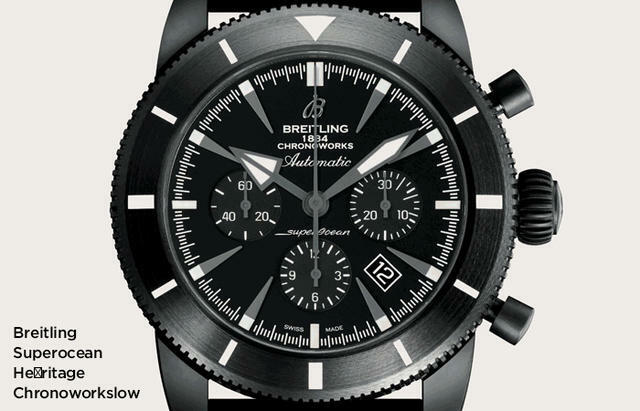 Breitling says that these five technical changes led to a significant increase in the energy efficiency of Breitling Caliber 01. As a result, Breitling watchmakers were also able to equip it with a slimmer (and thus longer) spring, which increases the resulting caliber’s power reserve from 70 to 100 hours: a 45% gain. Manufacture Breitling Caliber 01 Chronoworks is also officially chronometer-certified by the COSC. The icing on this technological cake is the woven rubber strap that echoes the original woven steel bracelet from the 1957 Breitling Superocean. This 2016 Breitling Heritage Chronoworks ($39,295) is a 100-piece limited edition that will be found at Breitling authorized retailers as well as its boutiques. 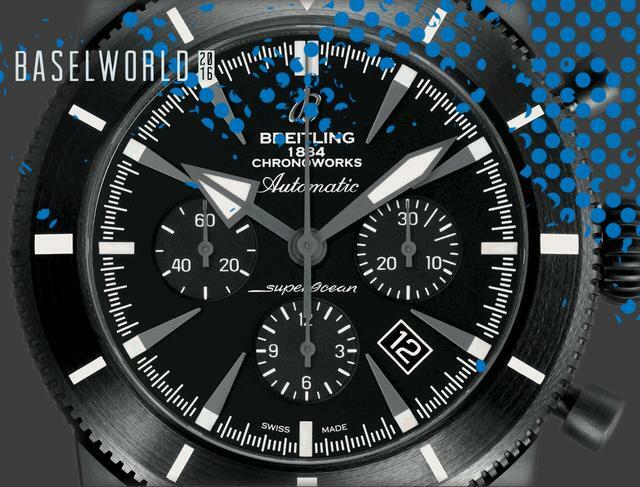 Two days into the Baselworld 2016 is sufficient time to gain a first impression, and this year’s zeitgeist is a combination of value-plays and moon-shot “statements.” Naturally, these trends often co-exist within the same houses as brands strive to hedge their bets and read the tea leaves of dramatically different market segments. Against a backdrop of sales dips in the year-to-date industry as a whole but also a late manic upturn in the bellwether U.S. stock indices, Baselworld has offered a series of watch trends suitable for a volatile world at large. No first impression of Basel novelties could start anywhere but collector mindshare hegemon,Rolex; the Geneva giant launched two powerful plays in its bedrock stainless steel sports watch segment. At the value end of the spectrum, Rolex has re-launched the Air King line that had been placed on hiatus for the prior model year. The family name is a long-lived one within the Rolex catalog that has stood as an enduring point of entry for collectors seeking a “crown” for the wrist. No longer petite and no longer subtle, the historically low-key and 34mm Air-King has followed the path of its three-hand Explorer brethren (3mm case growth spurt in 2010) and reemerged as a bigger and bolder model in its own right. The new 40mm Air-King reference 116900 emphasizes the model’s historic link to aviation with a striking full Arabic numeral dial that features green accents and a personality that belies its roughly $6,700 U.S. retail price. 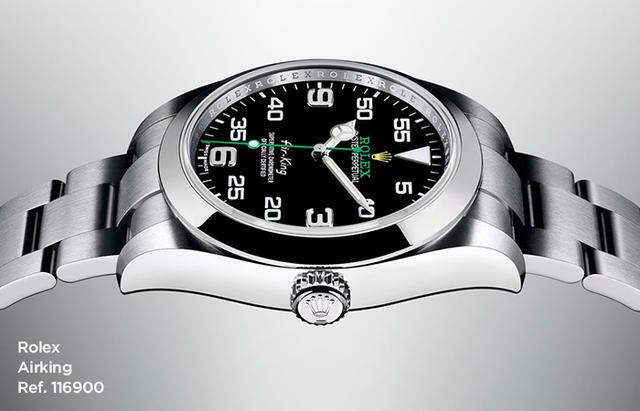 While this represents one of the most accessible prices of entry into the ranks of Rolex ownership, the caliber 3131 automatic nevertheless retains the new proprietary “Superlative Chronometer” status (-2/+2 daily deviation certification) that Rolex advertises in addition to COSC Swiss Chronometer certification. Rolex also recapitulated its commitment to the bedrock stainless steel Cosmograph Daytona with a new reference 116500LN bearing the signature 904L steel alloy beneath a new Cerachrom black ceramic bezel. While ceramic bezels have made periodic appearances in the Daytona line since 2011, the 2016 novelty marks the first instance of the stainless steel model being offered in conjunction with a ceramic tachymeter bezel. Both variants of the new Daytona 116500LN are being offered with the black ceramic bezel, but customers will have a choice of either white or black dials to complement the kiln-fired halo. 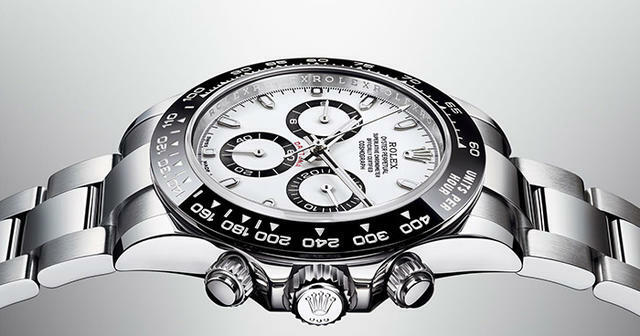 While Rolex frames the new Daytona variant as a tribute to the first of the “black tach” Daytonas, the 1965 reference 6240, the inclusion of Cerachrom is a forward looking evolution of the breed that reinforces Rolex’s dedication to its steel staple models. At roughly $13,300 U.S., the new 116500LN carries a clear price premium over the conventional steel Daytona, but it remains far clear of the precious metal variants. If there was any sense of trepidation or hedging in the product strategy of Basel’s corporate denizens, it evaporated at the gates ofHublot’s hulking black citadel.The brand launched the latest effort of its MP unit (“Master Piece” in Hublot parlance), the MP07, as a strident statement of excess for those who enjoy the week-long power reserve of the LaFerrari but prefer a supercar brand-neutral superwatch. For convenience all nine mainspring barrels and the 32-day power reserve of the MP-07 are energized by a power tool accessory similar to that featured on the original LaFerrari. The MP-07 features a flying tourbillon under a lateral display with magnifying crystal, and the side-scroll time display is designed to be read at a glance while the owner’s hands are engaged on the wheel of an automobile. In a year when others seek to hedge their bets, Hublot is angling for hedge funds; the MP-07 retails for a supercar-rivaling $276,000 U.S.
Hublot reinforces its core Big Bang collection with the 2016 Big Bang Meca-10 in black ceramic (500 pieces) and an unlimited edition in titanium. This complication rides on the strength of a new manual wind manufacture caliber 1201. Its 10-day power reserve explains half of the model’s nomenclature; the unique mechanically inspired movement architecture explains the remainder of the name. A glance at dial or caseback of the Meca-10 reveals what Hublot describes as an engineering-inspired mass of interlocking scaffold bridges with evacuated cavities and hash angles that recall raw mechanical imagery. Skyscraper frames, alloy racecar spaceframes, and elemental modernist sculpture helped to drive this signature aesthetic. 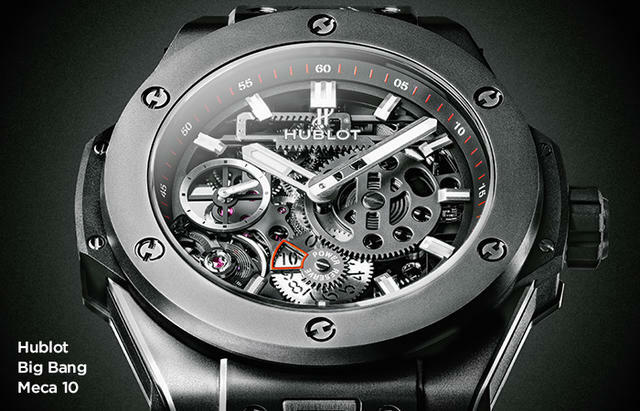 Amid the mass of “Meca,” Hublot includes two separate power reserve indicators. The first is located at six o’clock and acts as a rotary dial; its red colored companion sits hidden at three o’clock until summoned with two days of energy remaining. The Hublot Big Bang Meca-10 in black ceramic and titanium will retail for $22,000 and $19,900 U.S., respectively. Glashütte Original bridges the gap between Baselworld 2016’s value plays and its countervailing blue-sky boldness. GO’s new 40mm Senator Excellence collection is rooted in the classicism of a core three-hand design with tapered lugs, automatic practicality, and versatile character. At heart, the Excellence collection is a launch platform for the new caliber 36 manufacture movement. Its antimagnetic silicon hairspring is the first such component in the company’s history, and durability gains a second ally in the “bayonet” movement mount designed to endure a reported one-meter free fall onto hardwood – a German watchmaking standard GO adopted for the Excellence. A pared down barrel arbor combines with a new hairspring design and improvements to the drivetrain to yield a 100-hour power reserve. The Saxon manufacturer dedicated four years of development to the new caliber 36, and each movement will ship with a unique validation of this effort. 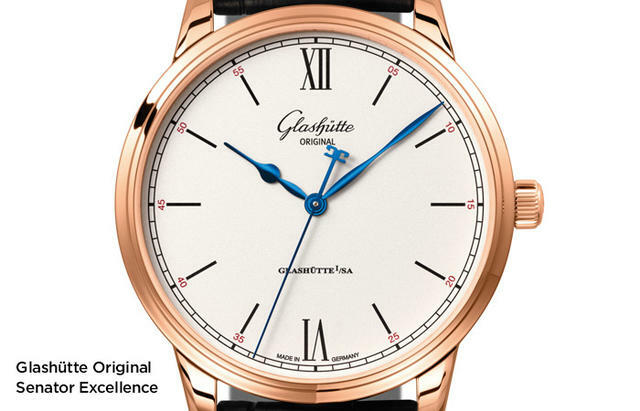 Glashütte will forward each Senator Excellence model with a certificate displaying the performance of the watch across a vast range of positions, amplitude at several hourly intervals after a full wind, and under a full power reserve trial. GO’s full battery of tests for this new in-house evaluation standard will encompass 24 days, and it will exceed the COSC Swiss Chronometer process in both duration and scope. Fully cased watches will be tested (COSC tests only movements), and owners with truly in-depth inclinations will be able to access even more esoteric aspects of their watch’s recorded performance on a GO website chronicling the entire test sequence of each individual serial number. The three Senator Excellence models will be available in both rose gold and stainless steel with silvered or black dials featuring either stick indices or luminescent Arabic numerals. The pricing spread for the new watch ranges from $9,700 for the steel variants to $17,700 for rose gold. At a Baselworld fair that seems split between value and exuberance, the new Glashütte Original Senator Excellence lineup offers the most practical solution for those who prefer to have it both ways.